Findings from new University of Florida research may lead growers to produce avocados in the Indian River region of Florida, an area where the citrus industry has fallen on hard times. The research comes from a dissertation by Cristina Pisani, who recently completed her doctorate in horticultural sciences at the University of Florida Indian River Research and Education Center near Fort Pierce. The center is part of UF’s Institute of Food and Agricultural Sciences. 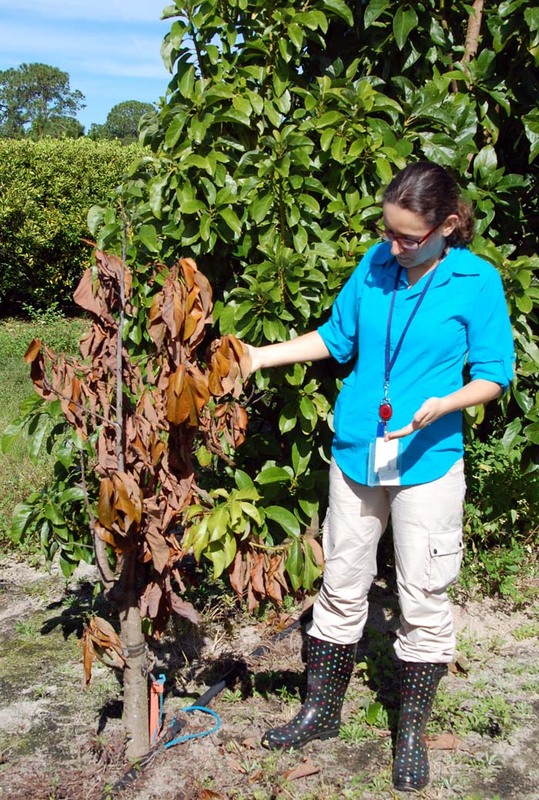 Cristina Pisani, who recently completed her doctorate in horticultural sciences, examines an avocado tree that succumbed to the laurel wilt pathogen. Pisani is standing in the USDA field adjacent to the UF/IFAS Indian River Research and Education Center near Fort Pierce. Her new research may give hope to Indian River region growers who want to produce avocados. For her research, Pisani studied a grove of about 150 avocado seedlings collected in California by Rey Schnell, a researcher at the U.S. Department of Agriculture Subtropical Horticulture Research Station in Miami. Schnell identified the true hybrids of avocado Hass and Bacon cultivars. Then the seedlings were planted at the USDA Horticultural Research Laboratory, adjacent to the IRREC. “Cristina’s contributions to avocado research are suggesting that some Hass-like avocado selections may be grown under Florida conditions and provide attractive options for growers,” said Mark Ritenour, associate professor of horticulture, who specializes in postharvest technology and served as Pisani’s graduate adviser. Another important focus for the research was to screen avocado hybrids for resistance to a disease called laurel wilt, spread by the redbay ambrosia beetle and its fungal symbiont Raffaelea lauricola, which kills avocado trees and threatens the crop nationwide. Although Pisani’s doctoral research is complete, she said the avocado research will continue as the Hass-Bacon avocado hybrids show considerable promise for production in the Indian River region. “There is still more research needed to decide if growers in the area could make a good profit from avocados and sustain the crops from disease,” said Pisani. Postharvest qualities in avocados are important because the fruit are shipped to markets nationwide, with customers looking for excellent quality, Pisani said. The project focused on selections comparable to the commercial Hass variety, a high-value crop produced primarily in California, she said. The nation’s top avocado-producing states are California and Florida, according to 2014 statistics from the National Agricultural Statistics Service. In southern California, the crop is produced on about 55,000 acres. In Florida, 7,000 acres are devoted to avocado production, primarily in Miami-Dade and Monroe counties. Pisani, Ritenour and the USDA think there is potential for increased avocado production in Florida, especially in the Indian River area, where citrus is in decline. Avocados are being studied as an alternative crop because a disease called Huanglongbing (HLB), commonly known as citrus greening, has reduced the once-thriving citrus industry. While citrus remains the most important crop along the Treasure Coast, many local citrus growers are eager to have alternative crops for cultivation. For more information about Florida’s avocado industry and the threat of laurel wilt, please access the website: http://www.freshfromflorida.com/Divisions-Offices/Plant-Industry/Save-the-Guac.